or a connection to your spiritual side? Take the step on the journey to inner peace. You will be supported step by step in the method of your choice. Book your appointment today. 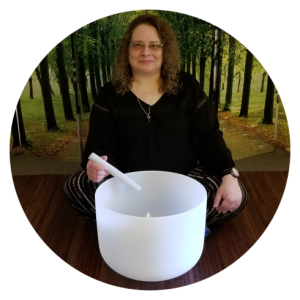 Personalized Guided Meditations – Imagine a meditation created just for you with your utmost personal needs and heart desires in mind. Imagine the support you would receive by this recording which may be to release negative thoughts and beliefs, explore your heart center, connect and receive Spiritual guidance, step into your power, deal with life changes, reduce stress and anxiety, free past hurts, heal relationships, open to abundance and prosperity, enjoy better health, embrace positivity, or practice self-compassion. Note: Links will take you to one of my other websites. We’ll assess together where you are in your life and what your needs are. We’ll pick one area of focus to begin. Later, we may add other areas of focus once the first area is addressed. We’ll design a program together to help you feel your utmost best. 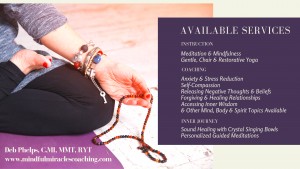 This may include meditation and mindfulness practices and worksheets, gentle yoga, personal journaling, a recommended book for you to read and discuss in our sessions together or other materials I have worked with in my decades of experience. Sound Healing if desired. We’ll meet on your schedule. However, most people benefit from consistent ongoing meetings (weekly or bi-weekly) for accountability and successful progress. Would you like to set up a 20-minute complimentary session to discuss the possibilities?